The Iris have finished flowering, so now is the time to split up the corms of those that have spread too far, and replant them. I spent most of the day doing this. On the way I noticed these two strange plants in the garden. I think the first one is some kind of wild orchid, and I think the second one is some kind of fungus. Anyone able to identify them for me? 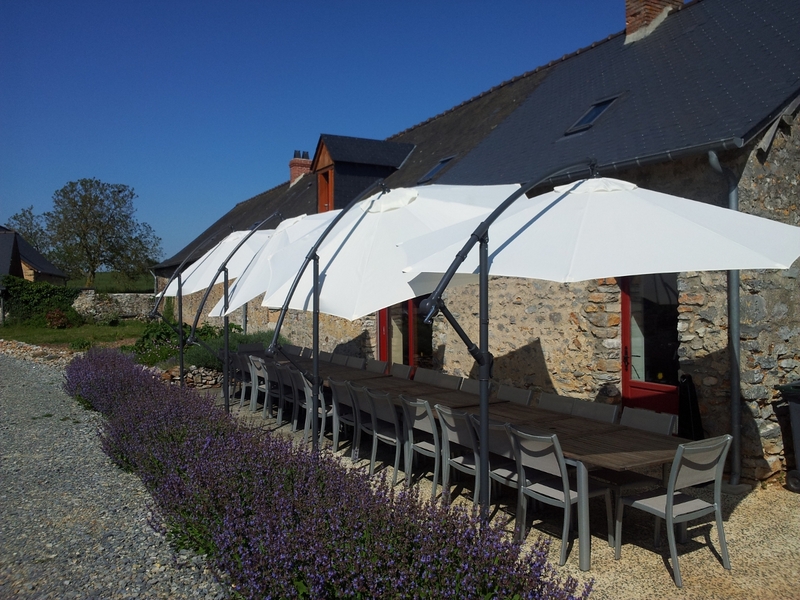 During the warmer Summer months, our gîte guests like to have a barbeque, usually on Sundays, for lunch. They can sit out on the terrace, enjoy the garden and sunshine, and tuck into steaks, chops and sausages, with a glass or two if they're not driving home that afternoon. The terrace is fully open to the afternoon sun, and sometimes this can become oppressive, so we have been keeping an eye open for a means of shading it. You can mount awnings on the wall, but the terrace extends beyond the end of the building, so either the awning would be too short, or some elaborate frame would be needed so support the protruding end. As an alternative, you can get nice free-standing metal frames with cotton coverings but they're hard to fit precisely around the tables, and would be awkward to get into and out from. The paving slabs are, incidentally, much cheaper than the option proposed by the shop: special weights designed for the purpose, 4 required per parasol at 25 euros each. i.e. twice as much in total than the parasols themselves. And it's an excuse for a photograph of my Sage plants: herbs for the kitchen, and decoration for free as a bonus! 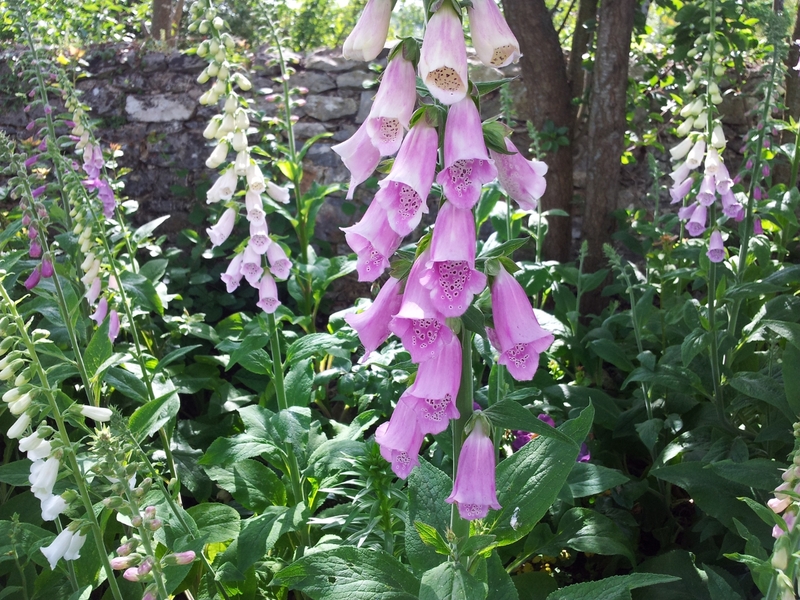 When I was introduced to Foxgloves as a child, I was intrigued. Why did foxes need gloves? Did they sneak up in the night to pull the flowers off and slide them onto paws for silent slinking? I tried slipping my fingers into the flowers on the plants, but they didn't seem very practical: no grip. And my parents warned me about the possibility of bees being inside so I might get stung. 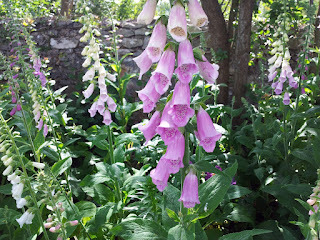 If you have a spot in your garden with dappled shade, where the soil doesn't get too dry, Foxgloves can be a good idea. Under the trees along our drive seemed like a good spot so I bought a packet of seeds of special hybrid ones few years ago, and the 6 or 8 plants I got from it managed to survive. Foxgloves are biennial, so you plant them one year to flower the next, and they die after flowering. So when I am cutting off the old flower spikes, I do a little medicine dance with them, shaking the seed pods over the ground so that there's plenty of seed for next year's crop. As long as I don't weed the bed too closely, and just let them grow, there's normally some flowers the following year. Sometimes I get a few plants, sometimes a lot. 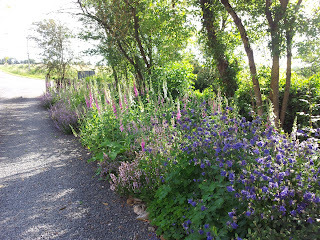 This year has been unusual, with the entire bed covered in Foxgloves. There's self-seeded Aquilegia and Sage too, all adding to the natural look and blending in with the blue-to-pink shades. The Rose bushes and Lilly plants are completely hidden by all this, but in a couple of years they will be too big to hide. And meanwhile, I think the effect is quite special.